Five years ago this past May, I found myself starting a new job and a new research project. 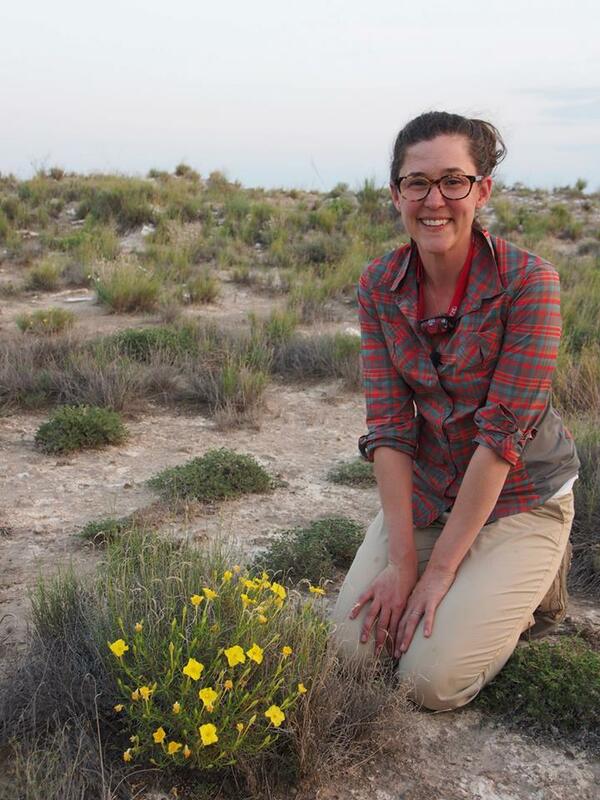 My job, of course, was as a conservation scientist here at the Chicago Botanic Garden, and the research project had me sitting on the side of a road at dusk in Pueblo West, Colorado. I sat there in front of a group of plants that produce lovely-smelling flowers, waiting for their impressive pollinators to show up. And when they did, I snapped some of my very first photos of these beauties: hawkmoths, better known as the five-spotted hawkmoth, or to the scientific community as Manduca quinquemaculata. Just this past Friday, I visited the National Science Foundation’s Dimensions of Biodiversity Program, to find this very same photo—and the research that my colleagues and I will conduct over the next five years—highlighted. So how did this one photo go from being taken in the spring of 2008 to being highlighted on the NSF’s website? How does a research project evolve and grow over time? Ask any scientist what they are currently working on and their answer will almost always start with, “I was first fascinated by x back in y….” Something caught their attention, sparked a thought, pulled them in—and they continued asking question after question, developing hypotheses and gathering data to test them, with their answers pushing them forward, sometimes down unanticipated paths, and sometimes into much bigger or smaller arenas. The more one knows, seemingly, the less one knows; old questions are answered and new ones are developed. This is what pushes scientists, and science, forward. In 2008, I started my current research program. After many conversations with Rob Raguso (Cornell University) and Tass Kelso (Colorado College), I drove out to Colorado with a plan to collect as much information on as many different populations of the Colorado Springs evening primrose (Oenothera harringtonii) as possible in a short period of time. That year, my timing was off—I arrived in Colorado on June 10. Oenothera harringtonii flowers primarily in May. Most of the plants had stopped flowering and so instead of collecting data on floral features, nectar, scent, and pollinators, my field assistant, Evan Hilpman, and I collected data on plant size, health, reproductive success (how many fruits did they produce?) and population size (much like a census). 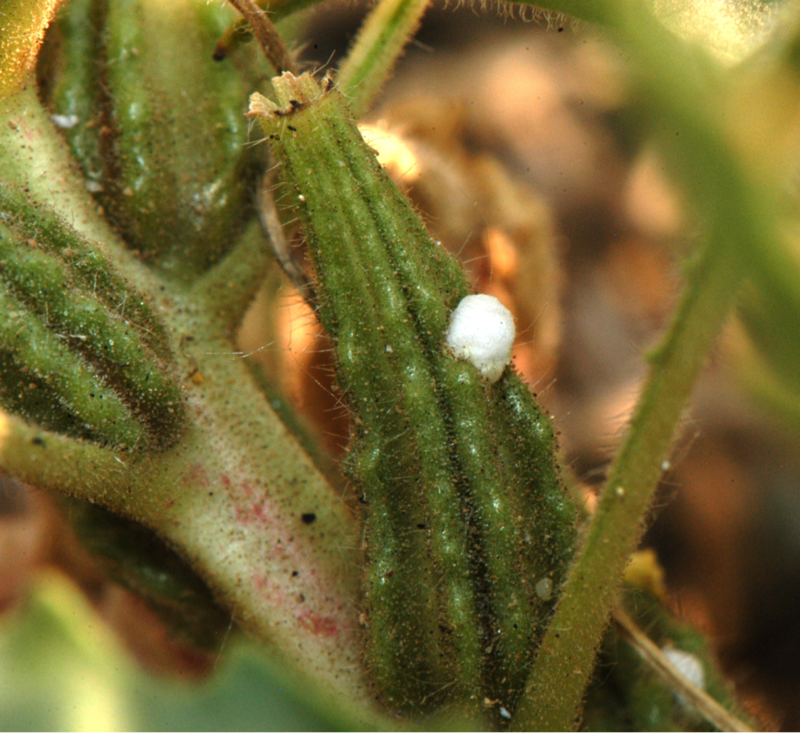 And one striking thing we noticed was this: small white “galls” on some of the green, developing fruits. We took notes on how often we saw this, never anticipating the importance that these little white dots would play in just a few years’ time. In subsequent years this project grew, and in the last four years—with the help of conservation scientist Jeremie Fant and other colleagues, and many research assistants and students—we’ve collected data on flower size, nectar volume and sugar content, floral scent, who pollinates and when (hawkmoths come at dusk and visit overnight; bees generally visit in the morning), how populations grow and shrink over time, which other plant species are flowering at the same time, and more. We know a lot of things about this species now, and one thing has been a constant: those little white balls have been observed year-in and year-out in some populations, but not in others. We know now that some of our populations have an important compound—linalool—and some do not. 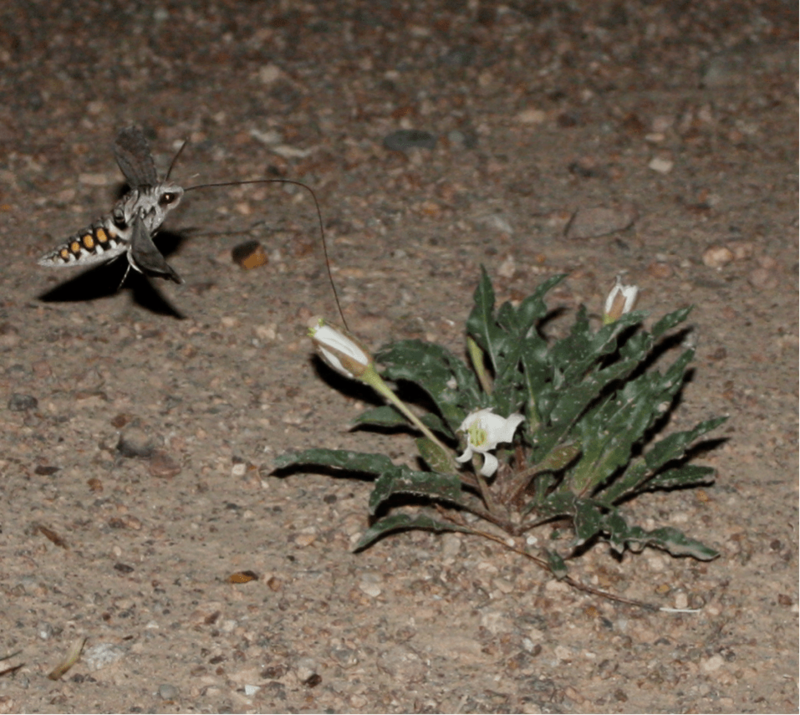 We know that genetically speaking, our 25 populations function more like three, likely due to the fact that hawkmoths can fly so darn far (some estimates are up to 20 miles in just one night). And more recently, we started gathering more data on those little white balls. It turns out that they are parts of the cocoons that surround the larvae of tiny little moths called microlepidopterans, which belong to the genus Mompha. 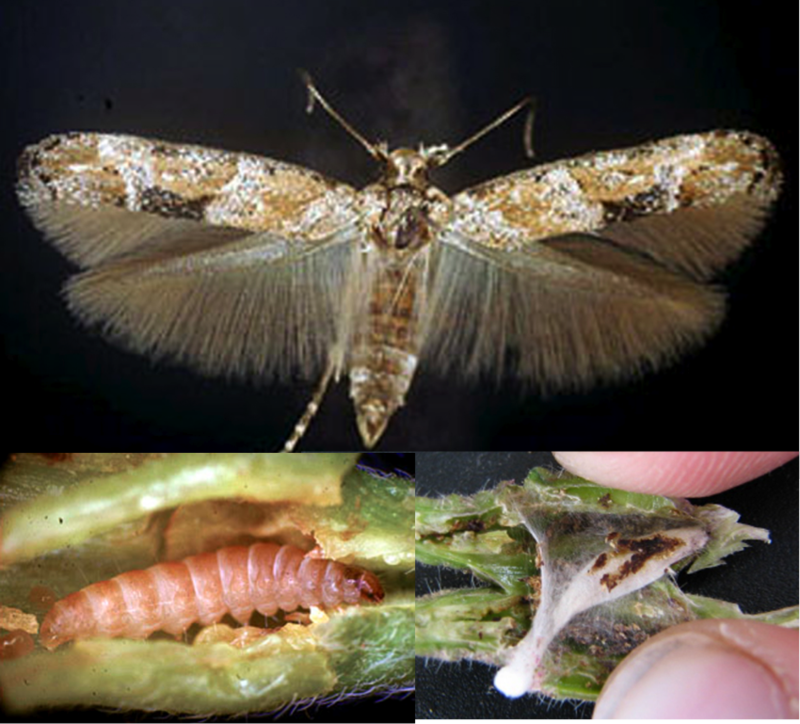 These moths lay their eggs on flower buds, fruit, and stems. If the larvae eat flower buds and/or seeds, they reduce the number of offspring that the plant produces. This is bad for any plants upon which these moths decide to lay their eggs, but everything must eat, right? In speaking with colleagues across the country and in Canada (plant and moth experts, alike), we developed an intriguing story and series of hypotheses we felt were compelling. 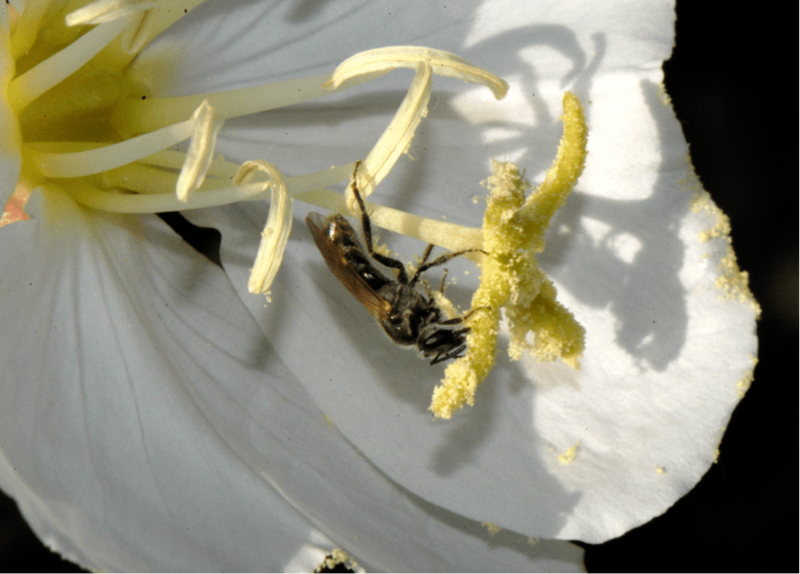 Do pollinators and floral antagonists both respond to the same attractive scent? 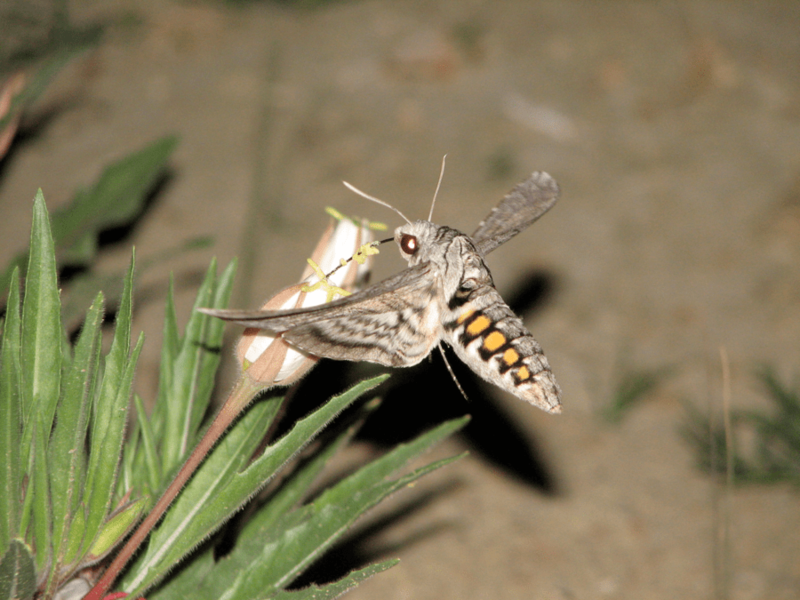 Could floral scent be telling hawkmoths and Mompha moths where the flowers are? Pollination is good for plant reproduction, but anything that eats flowers or seeds is not—so how would this trade-off play out in evolutionary time? Relationships among flowering plants and insects represent one of the great engines of terrestrial diversity. Floral scent and other plant volatiles are important drivers of these relationships (e.g., pollination, herbivory, plant defense), but remain poorly integrated into floral evolution and pollination ecology. Few studies have tested the spectrum of plant fitness outcomes when scent attracts both pollinators and floral/seed enemies. Thus, the hidden diversity of floral/seed predators and their potential as selective agents constitutes a considerable gap in pollinator-centric understanding of floral evolution. These “forgotten predators” have co-diversified with flowering plants and are likely influential in the evolution of most plant-pollinator interactions. This project is ambitious and large and pulls upon a wide variety of expertise. In total, there are 11 Ph.D. scientists collaborating on it, including myself, Jeremie Fant, and Norm Wickett here at the Garden. The others include Robert Raguso (Cornell University), Rachel Levin (Amherst College), Terry Harrison (University of Illinois at Urbana-Champaign), Jean-Francois Landry (Agriculture & Agri-Food Canada, Eastern Cereal and Oilseed Research Centre), Sylvia (Tass) Kelso (Colorado College), Kathleen Kay (University of California, Santa Cruz), Mike Moore (Oberlin College), and Warren Wagner (Smithsonian Institution). We are excited about what we’ll uncover in the next five years and will update you with progress as our discoveries unfold! This summer I was excited to see hummingbirds in my garden, but to my surprise I later discovered they were actually humming bird moths or sphinx moths. A group of 3 or 4 would come visit my garden every evening and early in the morning. We even snapped photos. I’ve lived in Chicago for more than 40 years and I had never seen them before.